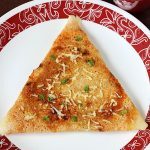 Cheese dosa recipe – A quick brunch, snack or breakfast recipe of crispy cheese dosa, Indian lentil crepes topped with cheese. 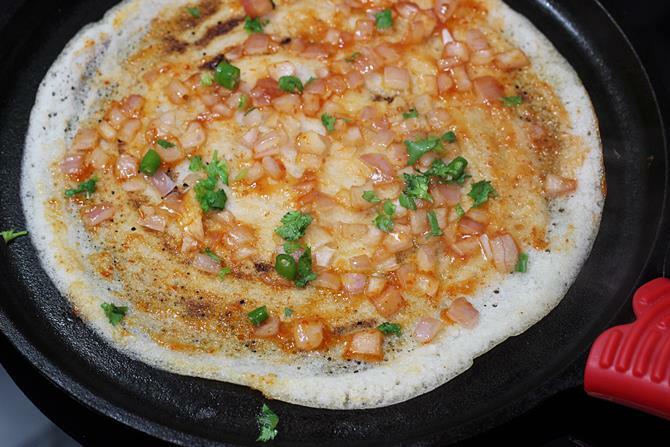 Dosa is a staple breakfast at home and is made & served in many ways. 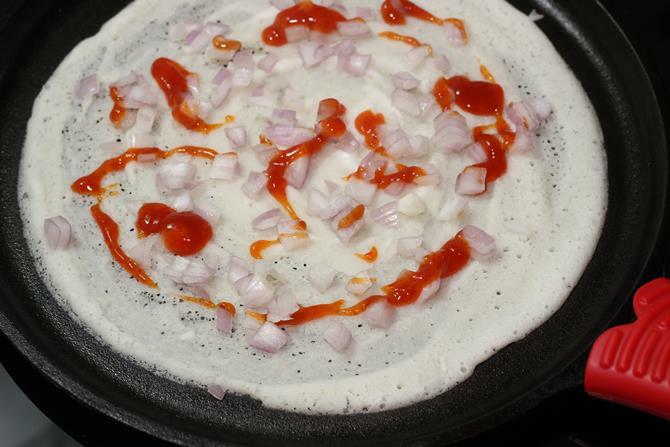 After the soft fluffy idlies, crispy dosa with a good chutney is one of our most desired breakfasts on most week days. 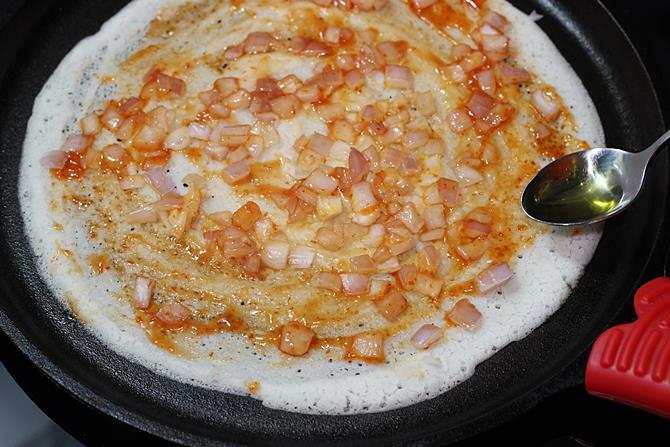 Cheese dosa is one of the common South Indian foods found on restaurant menus in Singapore. I made this sometime ago for our dinner and it turned out to be yummy. There are a few different ways of making cheese dosa, I am sharing the one which I personally liked. You can also make it for a weekend breakfast as it is slightly on the heavier side. It can be served even without chutney and goes great with a cup of black tea or black coffee. 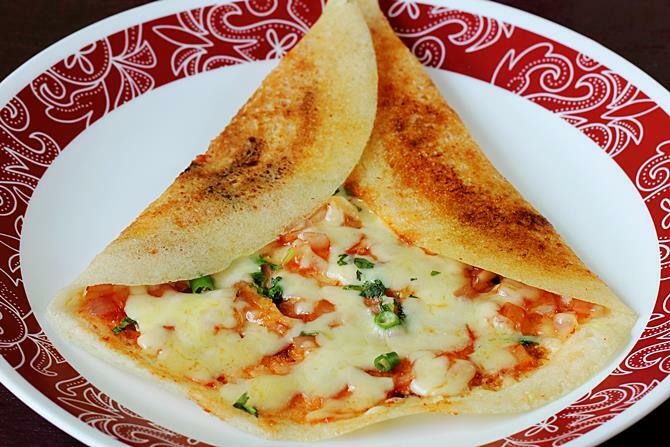 Cheese dosa recipe – One of the street foods of south India made with fermented lentil and rice batter, topped with cheese. Chop the onions, green chilies, coriander leaves and set aside. Grate the cheese as desired. Bring the dosa batter to right consistency. It has to be slightly thick but of spreading consistency. Grase you tawa with few drops of oil. Heat the pan on a medium high flame. 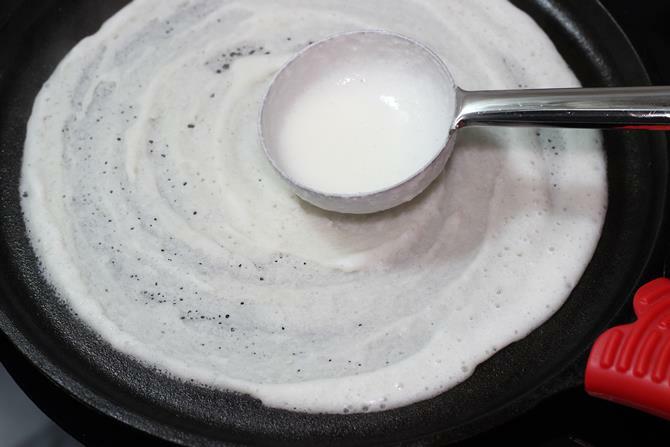 When the pan is hot, pour a ladle full of batter and spread it evenly to a dosa in a circular pattern. Add the onions and chutney or sauce. Smear it well all over the dosa. Press them down to the dosa with a wooden spoon. Add oil around the edges. 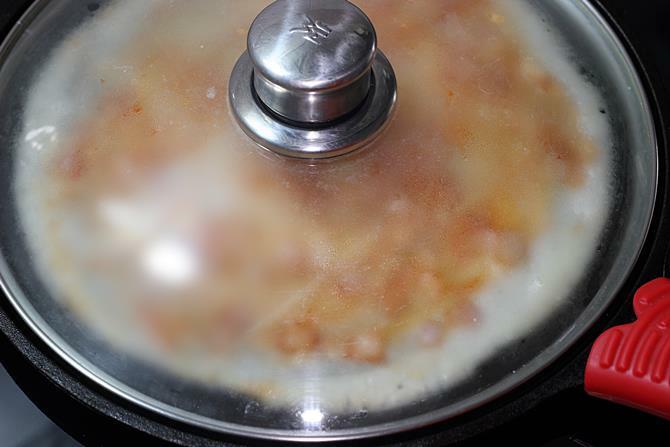 Cover and cook on a medium heat for 1 to 2 minutes. Sprinkle chilies and coriander leaves. Increase the flame to slightly high and cook until the dosa turns crisp. The sides usually leave the pan at this stage. Add the grated cheese. Allow to melt. Fold to a triangle. 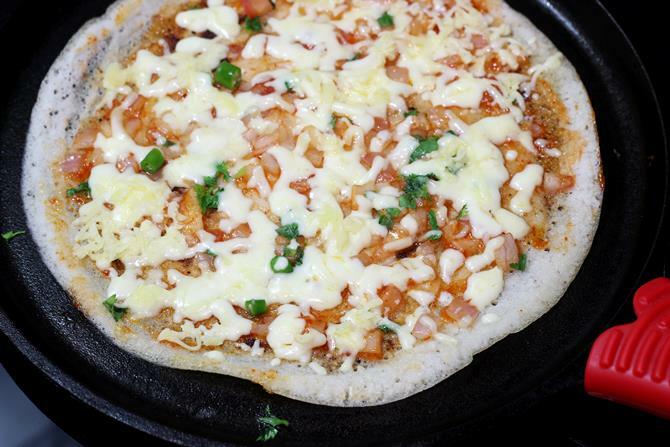 Invert it and sprinkle cheese and coriander leaves over the hot cheese dosa. 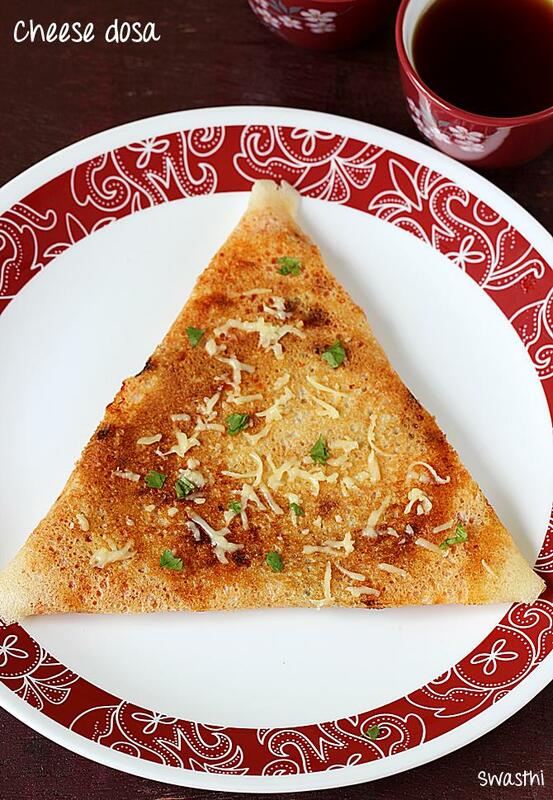 Serve cheese dosa hot with a cup of black tea or coffee. You can also serve with chutney. 1. 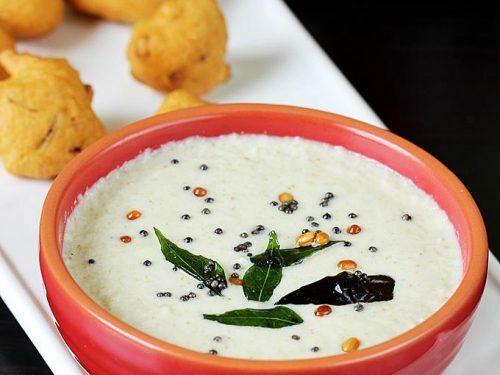 We will need dosa batter that can make crisp dosas. 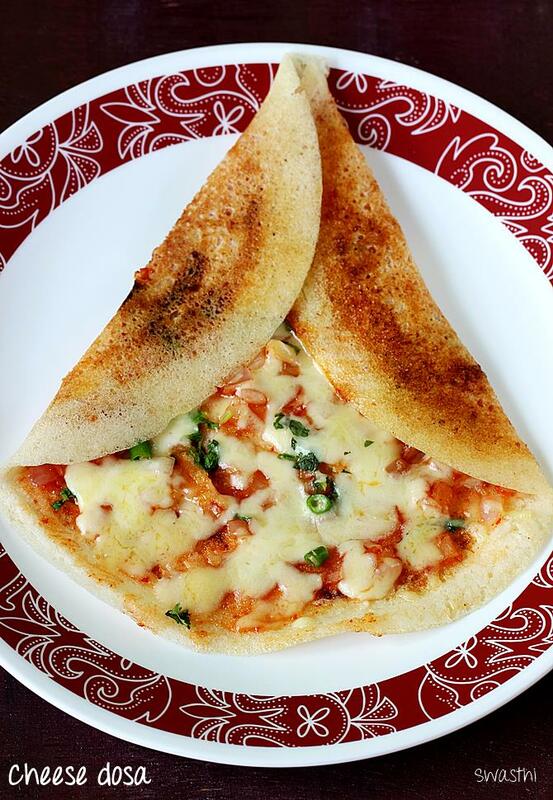 I make cheese dosa using the 1st recipe from this dosa recipe post. 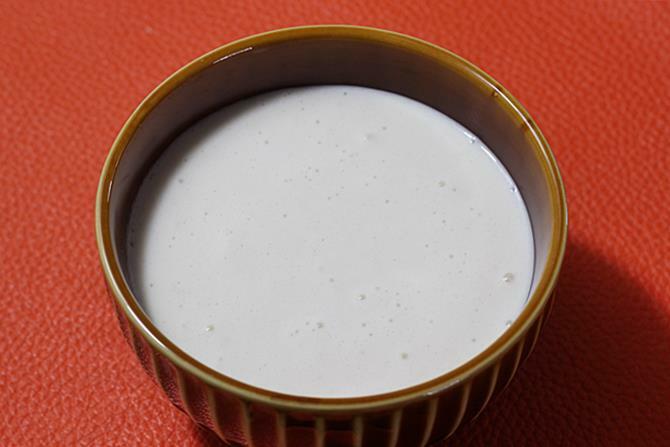 You can also use this restaurant style masala dosa batter. If you love soft spongy dosas, then you can also use the batter of set dosa recipe. 2. Make sure the batter is slightly thick but of good spreading consistency to yield crisp cheese dosa. 3. 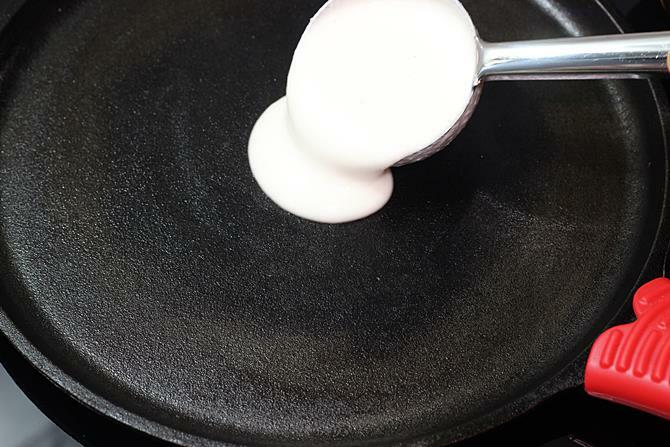 Grease or season your pan very well. I season my pan with oil after every wash and wipe off with tissue to get rid of excess oil. Heat the pan until hot enough. Put on the flame to medium and pour one ladle full of batter. 4. 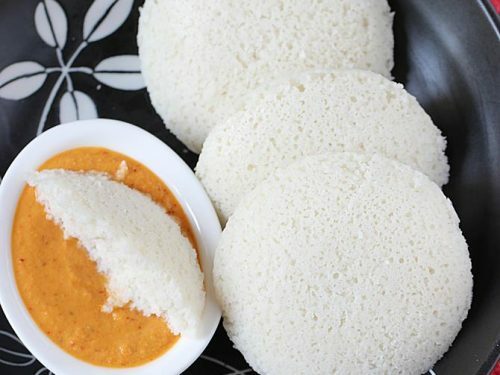 Quickly spread it evenly to a round dosa. 5. 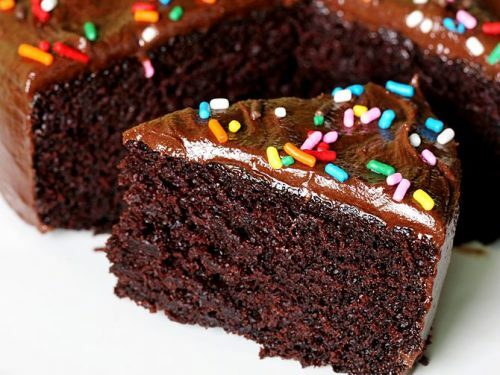 Allow the batter to slightly dry up on top. Sprinkle onions. You can also add thin sliced bell peppers and carrots. Add 1 tbsp of sauce or chutney. You can use whatever chutney or thick gravy you have at home. 6. Spread everything well. Add 1 tsp oil towards the edges. 7. Cover and cook for 2 minutes. 8. Cook further on a slightly higher flame until the edges begin to come up from the pan. 9. Lift it slightly and check if the dosa has crisped well. Then add grated cheese as per your liking. Also add green chilies or chili flakes and coriander leaves. 10. When the cheese begins to melt. Switch off. Fold as per your liking. Is there an alternate to the onions used in the recipe. I am not sure if the onion gets cooked thoroughly if not fried a bit. The raw ones leave a smell which my family does not like especially when they go to office or school. Can I fry onions before adding them. Will the taste differ. Also, can I use regular cheese or mozrella. You can just skip the onions. They get partially cooked and not fully done. Instead you can use grated carrots too.The main taste comes from the chutney or sauce used so you can totally skip the toppings. Mozzarella cheese goes well on this. 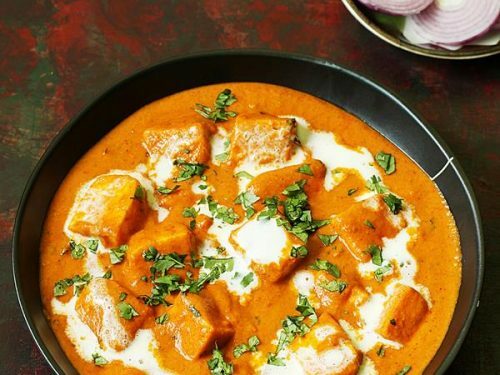 According to me only homemade paneer is the best kind of cheese for us to use regularly. Actually if we are able to find the block, real kind of cheese, free from preservatives or additives and synthetic rennet then any other kind of cheese are good. Unfortunately most cheese available in the markets are with so many hidden ingredients that a common man like us cannot even know what they are. 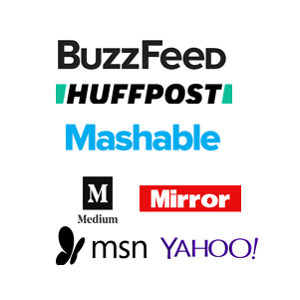 It depends on – in which country you live and the brand you choose. You will have to read the labels on the packs and then search online that particular additive or ingredient to know if it is healthy. 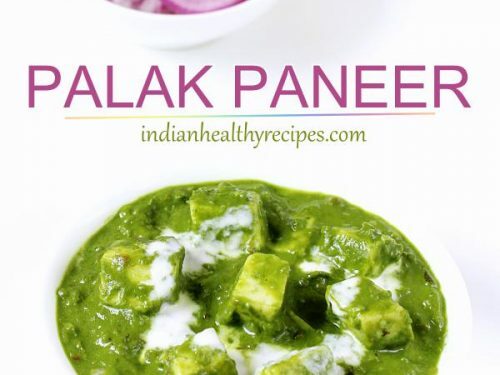 I mostly use paneer, cream cheese, feta and goat cheese. I also use mozarella, block occasionally. Try to avoid grated, ready to use, cubed or processed cheese. For extra shelf life they come with additives. Hope this helps. E-id mubarak!! have a great time !!! 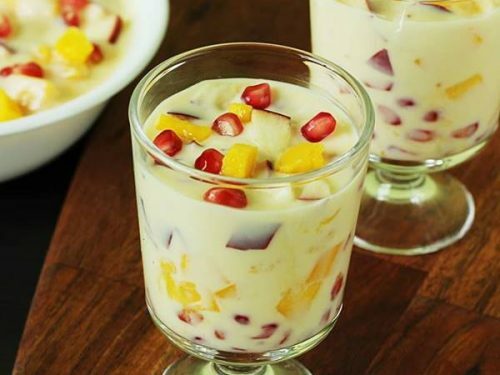 Hey..very nice recipe. Thanks for sharing..could you please tell methe brand name of the mixer grinder you are using? ultra mixer – heavy duty and good but delicate handles and lids. It can blend anything quickly in 30 seconds to 2 mins. I use national panosonic too – good but not as fast and quick as ultra. I use this whenever i have a problem with my ultra lids and handles. We take this to india as there is no service in singapore. I also use preeti steel – which is the worst I have bought so far. It takes long to blend any thing. my experience preeti blenders are not good. You are welcome. So glad to know you love the site. Thanks a ton.